The Return of Boston Duck Boats: The Boston Duck Boats have returned and are giving free duck tours for their first week back to Boston residents! Looking for more discounts and deals for the Boston Duck Tours? Enjoy Spring Skiing: If you can’t leave winter behind yet, head to Waterville Valley on March 31, 2017 for $1 Lift Tickets! Head to the Greenway: The Greenway Carousel at the Tiffany & Co. Foundation Grove reopens March 31, 2017 with rides for $3 and the Greenway Food Truck Season Opening Day is April 3, 2017! Enjoy Free Cone Day: Get a free ice cream cone at Ben & Jerry’s for Free Cone Day on Tuesday, April 4, 2017 from 12-8pm. Explore the Cambridge Science Festival: Celebrate Science April 14-23, 2017 with the Cambridge Science Festival with many free events during this 10-day festival. Check out a National Park for Free: National Park Week is coming this April 15-16 and 22-23, 2017 with free park days. Adams National Historic Park reopens April 18, 2017 in Quincy so enjoy free admission at the park that weekend for free! Swan Boats Opening Day: The Swan Boats in Public Garden return for the season Saturday, April 15, 2017 and is affordable fun for the kids! Rides are $3.50 for adults and $2 for ages 2-15. Celebrate Patriot’s Day with the Boston Marathon: The 121st Boston Marathon is Monday, April 17, 2017 from Hopkinton to Boylston Street in Boston and it’s free and fun to cheer on the runners! Free. ArtWeek Boston Returns: Enjoy ArtWeek Boston, an award-winning creative festival in Boston from April 28-May 7, 2017. Price varies, but many events are free. The Return of Open Markets and Farmers Market. Many open markets and farmer markets return this spring including SoWa Open Market which beigns on April 29, 2017. The Japan Festival on Boston Common: Head to Boston Common on Sunday, April 30, 2017 for Japan Festival Boston for a free day of cultural fun. The 34th Annual MayFair Celebration: Celebrate Spring with the Annual MayFair Celebration in Harvard Square on Sunday, May 7, 2017 with music, entertainment, crafts, food, and much more! Free. Free Boston Calling Block Parties: Head to Dewey Square on Thursdays starting on May 11, 2017 for Free Boston Calling Block Parties every Thursday night. Free. 21+. Explore The Boston Harbor Islands: The ferry to The Boston Harbor Islands (to select islands) returns on Saturday, May 13, 2017 and George’s Island and Spectacle Island are great islands to Explore! Keep an eye out for a free ferry day or head to your local library for a 2-for-1 weekday pass. Spend the afternoon at the Arnold Arboretum: Spend a beautiful day at the Arnold Arboretum or head there on Mother’s day on May 14, 2017 for Lilac Sunday! Free. Take a Stroll in Boston Common: Relax on Boston Common this spring or take the kids to the carousel for $3 rides, which reopens this April. See the Tall Ships: The Tall Ships make their return to Boston starting on June 17, 2017 with free events to see and board the ships. 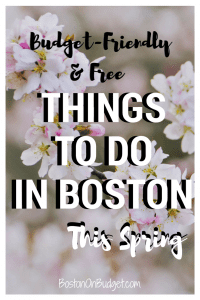 There are also cruises and other events happening around the city at a cost and Goldstar Boston has discount tickets for a few already up! 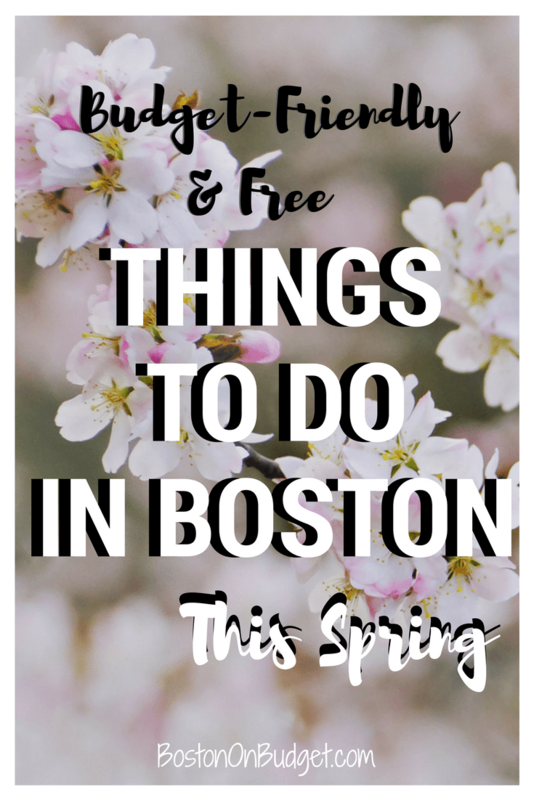 There’s so much happening this Spring in the Greater Boston area and there’s so much more to come! What are your favorite events and activities happening this Spring in the Boston area? What did I miss?